During our Simple Machines unit, we learned about levers. In this post, I start out talking theory. 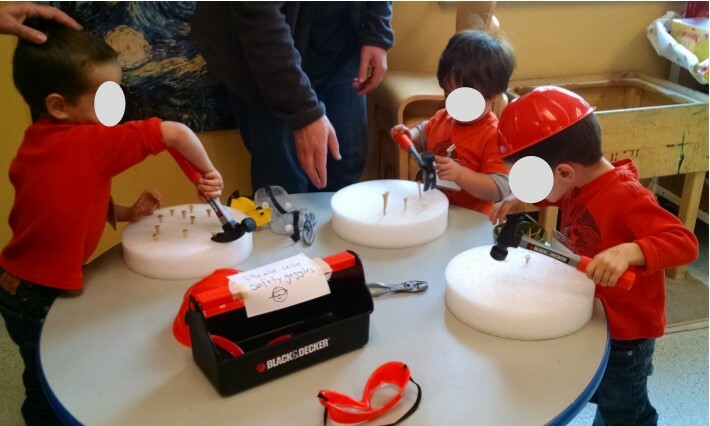 If you prefer, you can jump to the hands-on science activities for kids age 3 – 6. You place a long bar onto a fulcrum (pivot point). You apply force in one direction, and the pivot point re-directs the force in another direction. To lift the load on one end, you may need the same weight, or more weight or less weight on the other end… all depending on where the fulcrum is. If you’re working with small kids, stick to that basic point, and skip all the details I’m about to give on classes of levers! There are three classes of lever. A first-class lever has the fulcrum in between the effort and the load (e.g. between you and the weight you’re trying to lift). You push down on one end, and the other raises up. If the fulcrum is in the middle (like on a seesaw or a balance scale), then to lift ten pounds of weight, you need to apply ten pounds of force. There’s no mechanical advantage (i.e. the lever doesn’t let you lift anything heavier than you could normally lift). If you place the fulcrum very close to the load, and have a long bar to press down on, this gives you a mechanical advantage – it makes it easier to lift the load. You might do this if you had a very heavy load to lift, such as using a long lever to pry up a large rock. The load is in between the fulcrum and the effort. The best example is a wheelbarrow. You lift up on one end, and the fulcrum rests on the ground. Another example is a bottle opener where the fulcrum tucks under the edge of the lid, and one end of the bar rests on the lid. A see-saw is your ideal demonstration. You can put similar size kids on each end, and they see that it balances out. Then you can put an adult on one end, and see how many kids you need to lift the adult. And then you can try having the adult sit near the middle of the beam on their side, and one kid sit all the way at the end on their side and search for the balance point. If you don’t have a see-saw, can you create one? It may be hard to easily build something strong enough (and safe enough) to lift an adult and kids, but you could lift a basket of books using something as simple as giant tinker toys or a broom handle balanced over something. 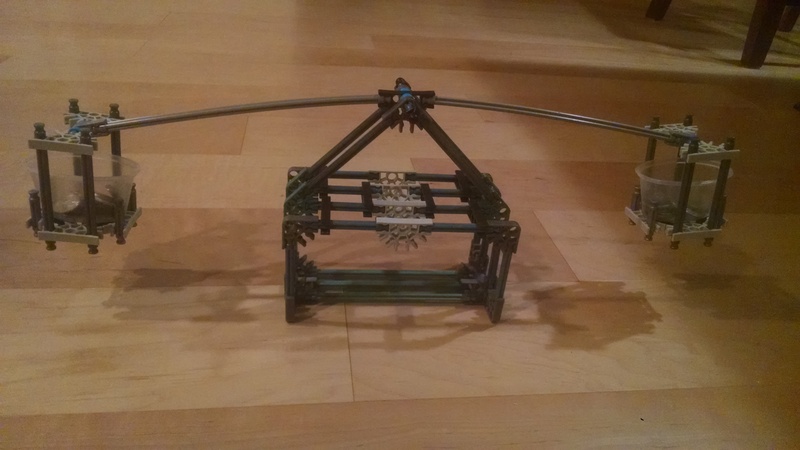 Or you can use the seesaw from a Simple Machines Set or rig up any other small 1st class lever model. I’ve listed several activities below. I’ve divided them by which class of lever they are. But again, you can ignore the whole idea of different classes of lever and just treat them all as “levers” if that’s better for the age group you’re working with. See-saw: If you have one on your playground, use it and talk about it! Balancing Act: We inherited part of the materials from the Delta Science Modules Simple Machines kit. 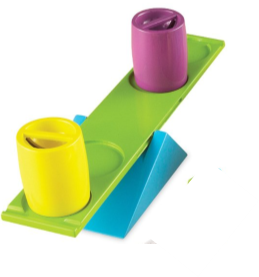 There are wood fulcrums (blocks that are rounded on the top and have a rough textured material added so the bar doesn’t just slip and slide), bars, plastic cups and bolts for weights. 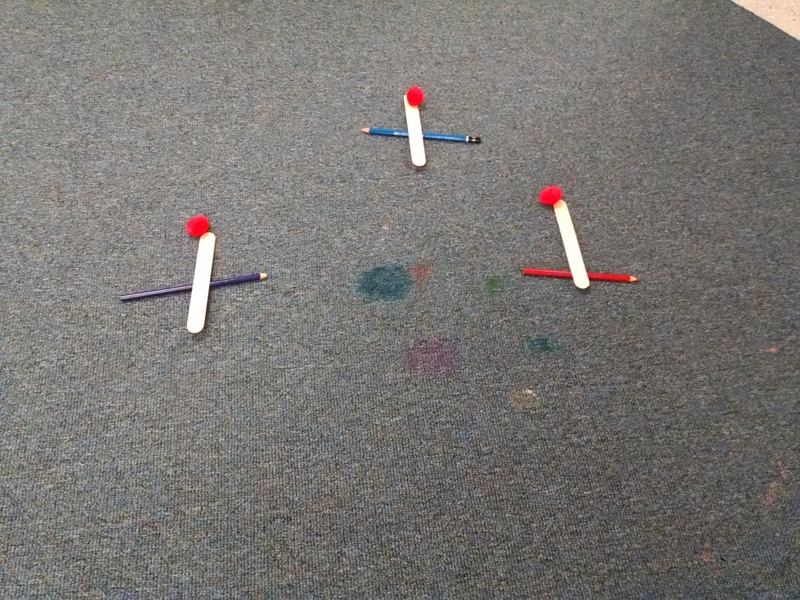 Kids can practice centering the bar and adding weights to each side. 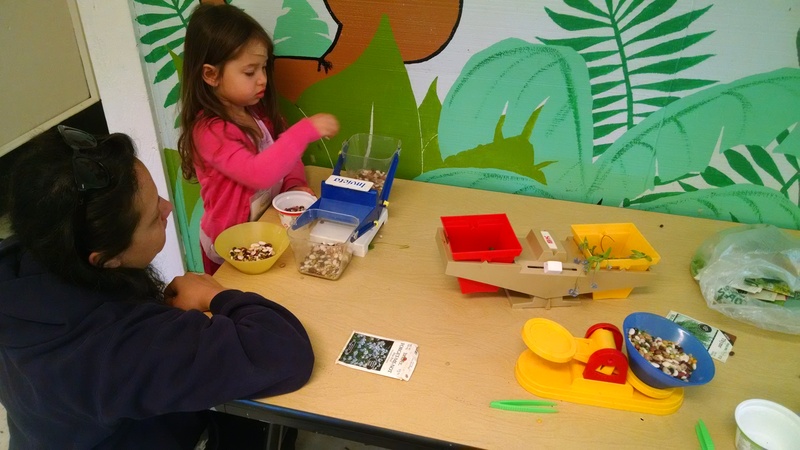 If you don’t have a scale, you could also build one with a variety of materials, including Tinker Toys or K’NEX. Materials: jumbo craft sticks with three holes drilled in them. Dixie cups, string or yarn, a pencil or dowel. Take two cups. Punch two holes in each one. 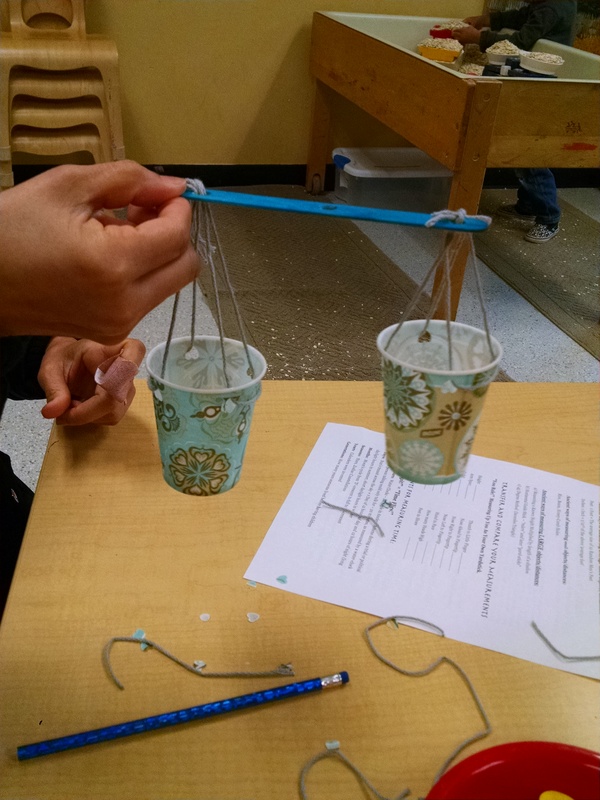 Tie a string to one hole on a cup, then thread it through the hole on one end of a stick. Tie the end of the string to the other hole in that cup. Now, take the second cup. Tie a string on, thread it through the hole on the other end of the stick, tie it to the other hole on the second cup. Hold the stick on its side, with the cups hanging down. Put a pencil through the middle hole to be your fulcrum. Put weights in the cups to balance. Claw hammer: When you use a claw hammer to pull out nails, you’re using it as a first class lever. If you had the kids pound golf tees into something for the wedges lesson, they can use the claw hammer to pull them back out! Crow bar: Use a crow bar to pry up a heavy load. Or use a stick balanced over a small rock to lift a big rock. Or use a stick balanced over a brick to tip a cinder block over. Or take a pencil, and a ruler and a book: use the pencil as your fulcrum. Put one end of the ruler under the book, and then press down on the other end of the ruler. Building Activity: We put out this Duplo seesaw kit. 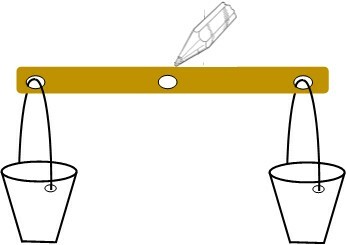 Catapults: Put a pencil on the table (your fulcrum). Balance a popsicle stick over it (your bar). Put a pompon on the lowered end (your load). Strike the other end. The pompon flies into the air. Your kid may repeat for hours. There are lots more catapult ideas in this post. Wheelbarrows: If you have access to a wheelbarrow, they are GREAT toys for outdoor time. Let the kids load them up and move them around. Bottle opener: Let your child open a bottle of soda with a bottle cap. 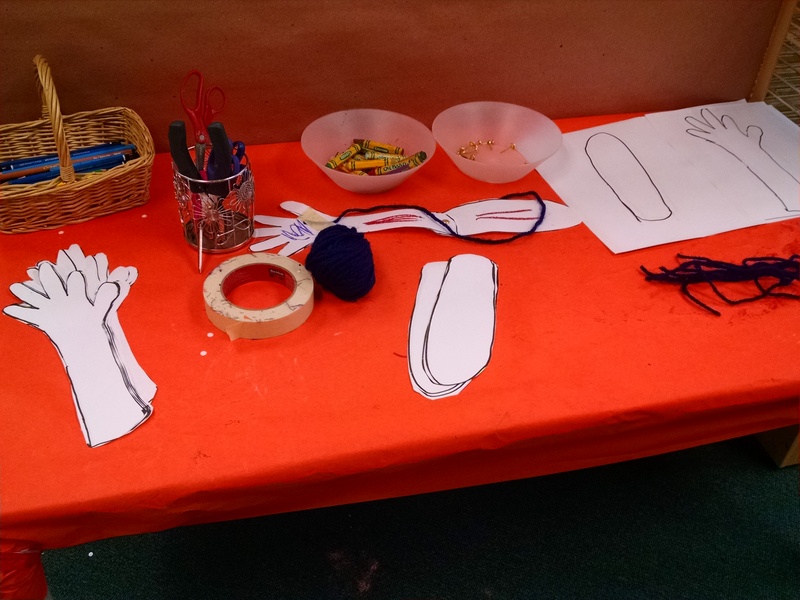 Human arm: We had paper arms kids could decorate, then cut, then fasten together with a brad to create an elbow joint. Then they used yarn to represent the muscle. You can find a similar activity at education.com. Baseball bat: In addition to helping you lift loads, levers can also be used to speed something up by giving it a push. During outside time, use a baseball bat, or tennis racket, or other tool to demonstrate. Your hands are the fulcrum. We filled the sensory bin with things to cut up with scissors, like straws, string, and paper. Then we added lots of types of tongs and encouraged kids to cut things up, then use the tongs to put them into a container. Great small motor / tool use practice. Nutcracker: A nutcracker is a double second-class lever. If you’re not a nut-free facility, cracking walnuts open can occupy kids for hours! Hammer: When a hammer is used to hammer in nails, it’s a third class lever. Creation Station: In our classroom, we have a creation zone filled with recyclables (toilet paper rolls, margarine container lids, and so on), and small dibs and dabs (buttons, interesting pasta shapes, shells, plastic gems, and so on). There’s always an open table with some glue and kids are allowed to create anything they want. 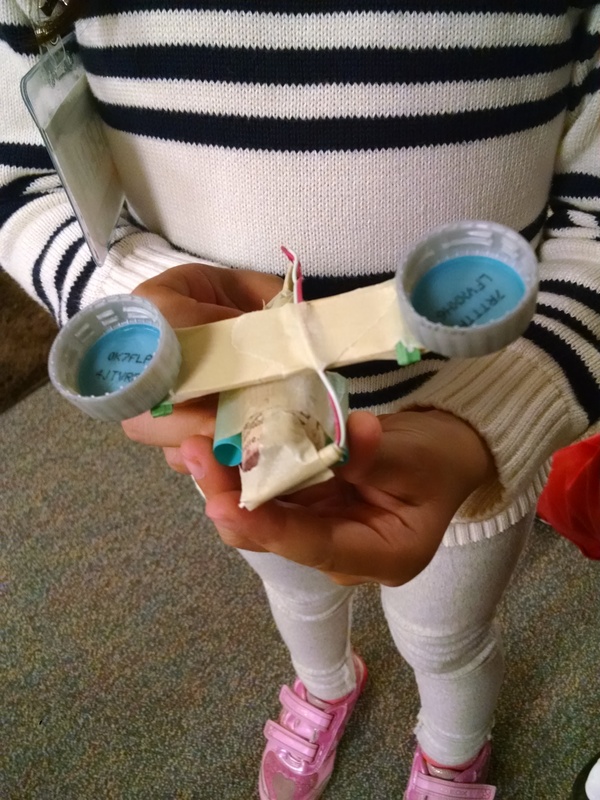 The oldest child in our Inventors Lab creates something fabulous each week, tied into the theme. On levers week, she built this seesaw. Building toys: We also have one room called “The Construction Zone” where we put out various building blocks or other supplies. This week we had giant tinker toys. In the picture at the top of this post, you can see what a dad and child created… it was a see-saw like balance scale, but notice that on the end near the child there are free-floating discs. Those are weights that can be slid back and forth to adjust the power of the lift. Snack: Use scissors to cut something – like pita bread. Use forks or chopsticks to eat with. Book: In circle time, we read How Do You Lift a Lion? (Wells of Knowledge Science Series) by Wells, our favorite Simple Machines book. More book recommendations here.